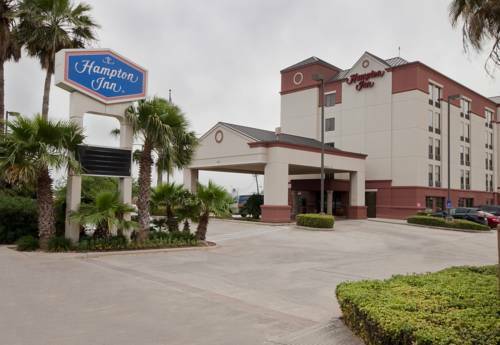 The Hampton Inn Houston-Hobby Airport hotel is located less than one mile away from Hobby Airport. This Hampton Inn location offers easy access to locations such as downtown Houston LaPorte NASA/Clear Lake and Galveston. Within minutes you will find a number of fine dining shopping and local area attractions. Take advantage of our free 24-hour shuttle service which also includes complimentary trips to and from Hobby Airport. We are less than 10 miles away from Downtown Houston and the Medical Center 15 miles from the Galleria and Clear Lake Area and one block from William P. Hobby Airport. Local charter services and shuttles provide convenient transportation to cruise ships in LaPorte Kemah and Galveston. The Hampton Inn Houston-Hobby Airport hotel features 119 spacious guest rooms swimming pool and whirlpool fitness center and complimentary high-speed wireless Internet access throughout the entire hotel. Each stay at the Hampton Inn includes amenities such as complimentary On the House hot breakfast complimentary parking cable TV with HBO as well as pay-per-view movies games and music. We have added lots of new amenities for our Hampton Inn hotel guests visiting the Houston TX area making for a luxurious experience in hopes to make you feel right at home. We love having you here in Texas at the Hampton Inn Houston Hobby Airport hotel.